Compatible with all 8-Series receivers, the TA-80 turns your favorite handheld microphone into a true digital wireless system and produces the full frequency response and natural sound of any premium wired microphone surpassing the traditional characteristics of analogue systems. The TA-80 has a flat and wide frequency response, ultra-low THD and noise floor, fast transient response, strong anti-interference, and high S/N ratio. The TA-80 also features 8 gain levels and is switchable between 12 and 48 V, up to 10 mA current load, to provide phantom power for condenser microphones. The phantom power can be switched off for dynamic microphones. 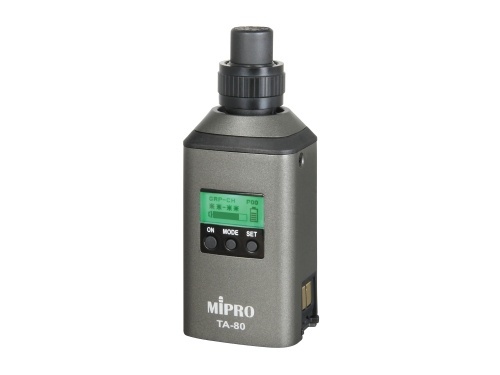 These transmitters are rechargeable with a single charge lasting 5 – 8 hours. Each includes a 1CR18500 lithium battery and full system purchases will include an MP-80 charging station. The TA-80 and 8-Series receivers are in stock and shipping now! This entry was posted in MIPRO, News by Fred. Bookmark the permalink.